I'm keeping this post intentionally brief, because it's my birthday and the subject matter is a bit sore for me at the moment. I'm sure you can understand/sympathize/empathize. Our 4th Round FA Cup match at Britannia Stadium against Stoke looked doomed from the start. Arsene deliberately picked what can only described as a group of our lesser Carling Kids, some old-heads, and Cesc. With our extraordinary number of injuries, not even Carling Cup stalwarts like Fran Merida were available, and Aaron Ramsey (fresh back from an injury himself) started the match on the bench. With Eboue off in Africa, Kerrea Gilbert and Gavin Hoyte on loans, we don't even have a second-choice right-back, so Francois Cocquelin (a holding midfielder by trade) was pressed into service there. I do certainly understand the manager's reasoning for selecting reserves: being between a rock and a hard place with a string of very tough league matches that could well determine our title chances, he prioritized what I think we can all agree is the more important prize, the Premier League, which means resting what's left of the first team. That being said, if you plan on resting your best players for a difficult run, why the hell would you play Cesc for 90 minutes? That made zero sense to me. Granted, being that my birthday celebration went down on Saturday night-early Sunday morning, I watched this match through an alcoholic haze, so if any of my reporting is off, I'm blaming Svedka and Kronenbourg. But I don't think booze affects my judgment at all when I say that part one of the Sol Campbell experiment was a spectacular failure. For me, Sol looked slow and, at times, completely lost. He had a hand in all each of Stoke's goals, failing to mark or challenge for balls and in one case playing the eventual goalscorer onside. He did Fabianski no favors and the Polish 'keeper was taken advantage of. One can only hope that his form and fitness will improve, although that may be asking a lot, but at the same time I have really been hoping for news of this Chris Smallings transfer to go through since the match ended. But again, this is my judgment, so feel free to persuade me otherwise. Arsenal seemed to keep the bulk of possession but lacked any inventiveness in the final third. We were able to even the score a few minutes before half-time when Cesc won a free kick outside of the left corner of the box. The captain cheekily passed the free kick sideways to Denilson, who struck a low shot from the edge of the box that zipped by the keeper, seeming to take a slight deflection (possibly two) along the way. 1-1 at the half gave me a bit of hope. In the second half we saw more of the same, Arsenal keeping possession but being completely unable to do any real damage in attack. But we became vulnerable to the counterattack, and Stoke took full advantage. The counterattack, which had once upon a time been the strength of the great Arsenal sides of the last decade, had again been the bane of the current side. Sidibe took possession of the ball and raced up the left side (I still have no idea where Traore was at the time; possibly buying a hot dog), leaving a disinterested Denilson to seemingly half-heartedly chase after him without so much as a challenge to man or ball. It reminds me, on second-viewing, of Silvestre just giving up against Drogba in the FA Cup semifinal last season. The apparent lack of effort was appalling. And this came after Arsene had made three substitutions of regulars for Carlingarteners. Arshavin, Ramsey and Eduardo entered the fray, yet Arsenal could still get nothing going. To compound the travelling fans' dismay, Stoke scored a third and final goal not long after to secure the advancement and the Gunners' exit from the FA Cup. 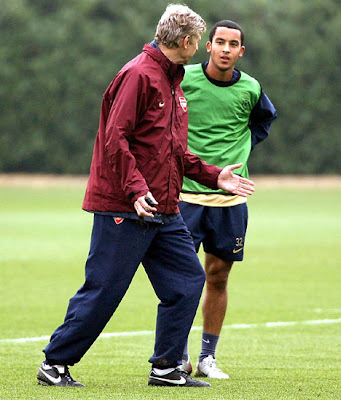 That Arsene was forced to remove Walcott tells you all you need to know about his performance. I haven't been happy with Theo for some time, for a variety of reasons, which I'll list here: 1) While he can't necessarily be blamed for it, he's constantly bloody injured. I'm shocked he lasted as long in this match as he did. Diaby has had much the same problem in the past, but spent the entire summer working out to reduce these risks, and he's been largely rewarded for this. 2) Related to #1, Theo seems to place far more importance on his role in the England squad than he does his place in the Arsenal side, so for me, his priorities are out of whack. While his dedication is a boon for Capello, it does Arsene Wenger no good at all and he's often left with an injured player that we must pay to sit in the treatment room. 3) There has been little to no improvement in Theo's all-around game since his arrival at Arsenal in 2006. It's been four years and he still makes the same mental mistakes he made as a boy. His inadequate skill level, to me, makes him a victim of his own gifts; his blistering pace has for many years been enough to cover for his technical failings, and at Southampton that made his name. but it's not good enough at the top level, and it's time he stopped trying to dribble directly at defenders and learned how to better use technique to help him. If anyone thinks I'm being especially harsh on Theo, I suppose it's because the English press fawn all over him and lose no time praising him, and he faces no criticism for his rather more consistent failings, which may be part of the problem. I'd have much more respect for him personally if he bitched less about not being "rewarded" with a central striker role and instead pulled up his socks and went about working to improve his game and grow as a footballer. 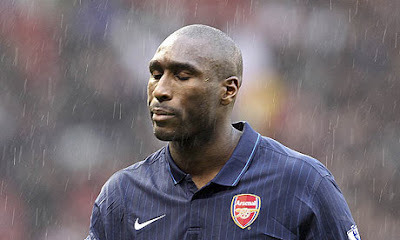 I desperately want him to achieve and earn the #14 shirt so long worn by Arsenal's greatest player ever, Mssr. Henry. But there has been little sign of it this season, unfortunately. Theo of course wasn't helped in this match by the ineptitude of Carlos Vela, who seems to waste each chance he gets. Basically, there were very few positives to take from this match, apart from a stalwart performance by Craig Eastmond in midfield, who really seems to be coming along as a player. More to come please. Fabianski's performance was a bit iffy, although it's hard to blame him for the goals that were scored when he was so frequently left exposed at the back by Campbell and the woeful Traore. Odd that Armand began filling in for Clichy and Gibbs so well, but has seemed to completely regressed. It's unfortunate, for him and for us. Enjoy the fine English weather we're having in New York, and, as always, you stay classy, mon Arsamis.